I had been in Portland for all of 36 hours when I realized I had developed a routine. 7am: wake up sans alarm, turning off my three "just in case" alarms. Leave my hotel, saying goodbye to the same chipper doorman on my way out. Walk down the same downtown street, passing the same homeless guy wrapped in a blue fleece blanket. Decide that, meteorologically speaking, Portland wouldn't be too terrible a place to be homeless in (if you absolutely had to, that is). Walk into the nearest Stumptown Coffee, standing behind the same befuddled Norweigan couple still unable to navigate the American sizing system. Oder a latte (with skim, please) and a bite to eat, choosing between the apricot/honey/cardamom scone and the hazelnut/sour cream/blueberry muffin. 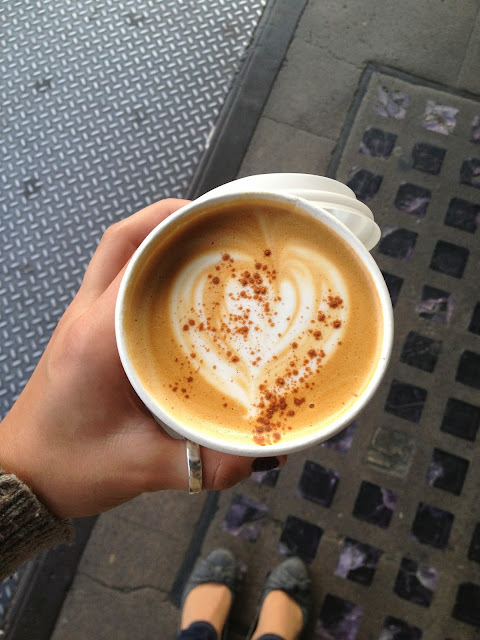 Sprinkle some cinnamon into my coffee while admiring the artful frothy stylings of my barista at large. Sip. Breathe. Enjoy. I only remained in the rainy Northwest for about 20 hours after that second Stumptown latte. I was there for work, on a schedule, and didn't have much time to linger. I was amazed, though, at how quietly necessary it was for me to establish a personal routine. I was in an unfamiliar land and needed a constant, albeit a small one, and found it in my mornings. Had I stayed in Portland for longer, I absolutely would have worked my way through the dizzying array of independent coffee roasters offered by the city - but I only had two days, and a lot of stressful work to accomplish within those two days - and relished in the comfort that the same 12oz. latte could provide.